Both retailers and small businesses say the exceptionally cold weather in March damaged business activity. The British Retail Consortium (BRC) said the number of people visiting shops last month was 5.2% lower than a year ago. Meanwhile, the Federation of Small Businesses (FSB) said the March freeze cost the UK's small businesses £174m. 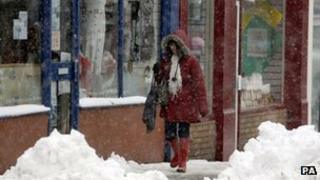 It said more than half of small firms admitted that cold weather damaged demand and closed businesses. The FSB reported that the £174m it estimated had been collectively lost by small businesses broke down to an average loss of £1,580. The BRC said that the worst affected regions were the East Midlands and the south west of England, with "footfall", the number of people entering retail spaces, down by 8.1% and 7%. High streets across the country on average saw the biggest drop in activity, with visitor numbers down by 7%. Out of town retailers were the next worst hit, with numbers down by 4.2% and shopping centres, which offer the most protection against the weather, down by 2.4%. But although footfall numbers were sharply lower, last week the BRC said sales for the month were 1.9% higher in March than a year ago, a situation it described as "encouraging". Helen Dickinson, British Retail Consortium Director General, said: "The prolonged cold was the main culprit for deterring shoppers, especially compared against the far milder March of 2012. "It's not all bad news: our March sales figures were fairly strong, even if you strip out the data for the Easter weekend which fell earlier this year than in 2012. This suggests that, when people did venture out, they bought things." A separate report by accountancy group Ernst & Young expects the UK economy to expand by just 0.6% this year. Its Item Club spring forecast said that the overall economic growth will be led by a modest 1.2% rise in consumer spending, and continuing recovery in the housing market. It added that exports would remain weak, as economic woes in the eurozone hit demand from Europe.